On November 20, Starmobile announced a total of 12 new smartphones and tablets and one of those new offerings is the Starmobie Muse. The name to me does not sound appealing or catchy or anything that would make me take another look again and check what the phone is capable of providing and what does it have (but I still did check it out). However it tells me another story when I found out the technical specs of the Muse. It's a slim smartphone and I just love that 5-inch full HD 1080p display of the Muse. That full HD is a 1920x1080 pixel resolution which also has 441ppi or pixel per inch. Inside the Muse is a Mediatek Turbo 1.5GHz quad-core processor with 1GB of RAM. The internal storage is pegged at 16GB, unfortunately it does not support microSD card for memory expansion so that's I think is one of the downers here. I like phones that have option to add storage space, and I don't like deleting old stuff in my phones just to accommodate additional data. Regular-sized SIM and micro SIM cards are also usable for the Muse and both can be used via 3G networks. The cameras of the Starmobile Muse are very much the same as the cameras we found in the Starmobile Knight, where the rear facing one is at 18MP with BSI and LED flash, the front camera here is a little bit upgraded at 8MP but now features wide-angle lens, BSI amd LED flash. Perfect for selfie purposes (hehe). This smartphone's connectivity is not going to be an issue here, aside from the mentioned 3G feature, WiFi b/g/n, Bluetooth 3.0, GPS and GLONASS are also on board. GLONASS is the short term for Global Navigational System Support, we also see this feature on Cherry Mobile Navi. According to Support.Garmin.Com, "GLONASS is a Russian satellite-based navigation system that works alongside GPS (Global Positioning System) to provide position information to compatible devices. With an additional 24 satellites to utilize, GLONASS compatible receivers can acquire satellites up to 20% faster than devices that rely on GPS alone.". Before I forget to mention, Muse will, just like other recent Starmobile android devices, will run on Android 4.2 Jellybean. Battery is 2,300mAh. You can take this home for only Php12,990. Although the Starmobile Muse offers pretty nice specs apart from the internal storage, it still does not beat MyPhone Iceberg Mini as my 2013 favorite local-branded smartphone. Check tat link out to find out more information about the Iceberg Mini and why I still like it. 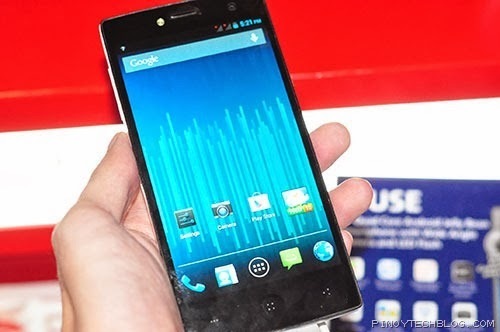 Starmobile Muse will cost everyone who wants to buy it Php12,990.